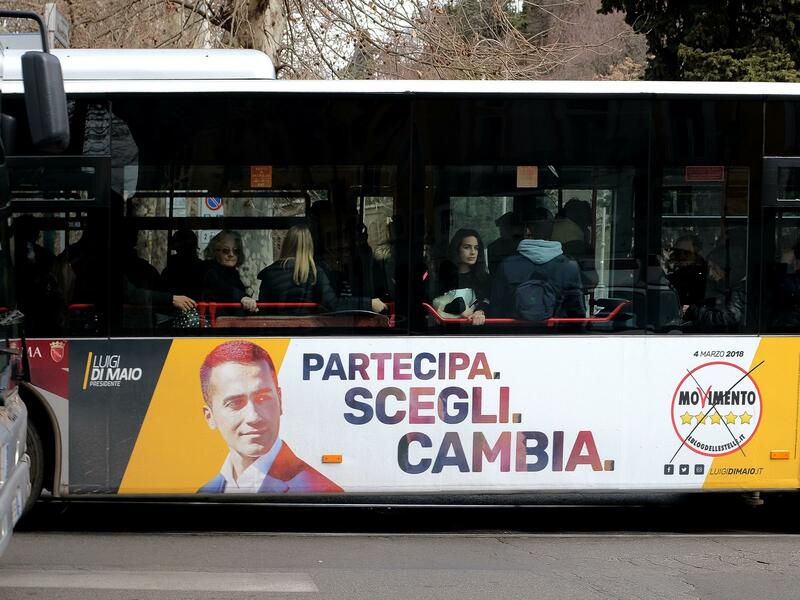 An election poster for the 5-Star Movement showing leader Luigi di Maio and the motto "Participate. Choose. Change" is seen on the side of a bus in Rome ahead of the March 4 general elections. 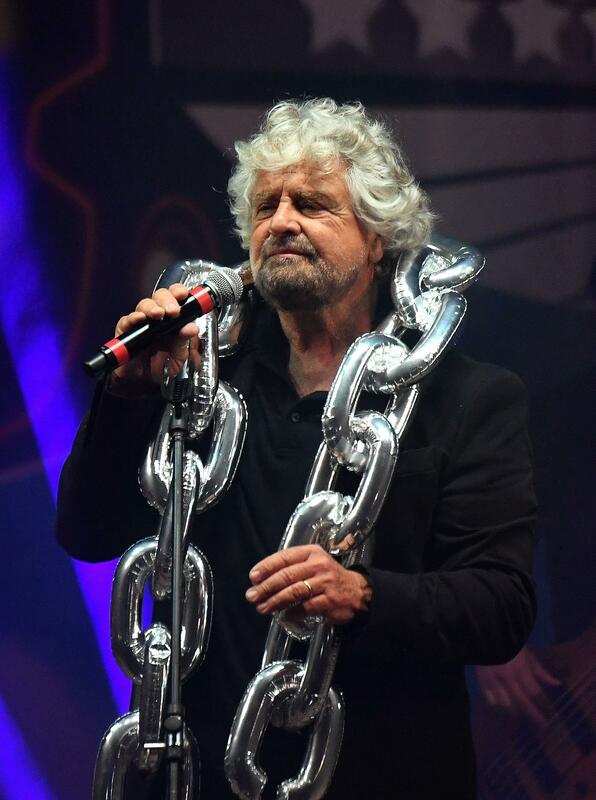 5-Star Movement founder Beppe Grillo, a stand-up comedian, performs during a party meeting in Rimini last September. In Italy, polls ahead of Sunday's general elections suggest the maverick 5-Star Movement is more popular than any other party. Founded in 2009 on an anti-establishment platform by Beppe Grillo, a vitriolic comedian, it's setting its sights on heading Italy's next government. 5-Star claims to be an Internet-based direct democracy movement and has attracted many Italians disaffected with traditional parties. It's openly populist — with positions that are anti-immigration, anti-vaccination and anti-European Union. In January, 5-Star's 31-year-old leader Luigi di Maio announced his party's parliamentary candidates. He said they were chosen to counter charges of incompetence by critics of the movement. The candidates ranged from teachers and surgeons to the admiral who commanded naval operations in NATO's 2011 attack on Libya. "These are not competent people, they are super-competent," Di Maio declared. "In politics," he added, "both brains and heart are needed." Hours later, though, the admiral withdrew — it turned out he had been elected on a rival party slate in his town in 2017. More embarrassing was the recent expulsion of some dozen 5-Star members of Parliament who broke their own party's rules obliging them to give 50 percent of their salaries to a small business fund. Rome's city hall has been run by the 5-Star Movement since June 2016, but Mayor Virginia Raggi is widely criticized for a decline in city services such as garbage collection, public transport and road maintenance. "Look at these 5-Star people! They think they are saints!" says Claudio Zampa, a stall owner at a central marketplace. "We all voted for them last time, but never again." Despite bad reviews in Rome, 5-Star nationwide is the No. 1 party in the polls, projected to win more than 27 percent of votes. The incumbent ruling party, the Democratic Party, is behind, projected to win less than 23 percent. A center-right coalition of three parties — former Prime Minister Silvio Berlusconi's Go Italy, the populist League and Brothers of Italy, with neo-fascist roots — is polling at 37 percent. Many analysts worry about 5-Star's foreign policy — including a call to lift EU sanctions on Russia. Grillo has praised both President Trump and Russian President Vladimir Putin as strong statesmen, calling them "a blessing for mankind." When Trump won the U.S. presidency, Grillo said, "It is the risk-takers, the stubborn, the barbarians who will carry the world forward." Jacopo Iacoboni, a journalist with the daily La Stampa and author of The Experiment, a book on the 5-Star Movement, says that while no proof has emerged showing Russian financing of the movement, "We have strong evidence of a series of meetings with Russian officials and there are a lot of people in the 5-Star that are openly pro-Russia." Buzzfeed News has reported that 5-Star platforms posted content from the Russian outlet Sputnik as well as many fake stories, including a claim the State Department secretly funds traffickers smuggling migrants to Italy. Grillo has dismissed accusations of spreading pro-Kremlin propaganda and fake news online as "ridiculous." But Michele Testoni, an international affairs professor at Rome's John Cabot University, says 5-Star has mastered the use of automated social media accounts known as bots. "They are created exactly to invent issues or to spread massively news that are favorable to the party, maybe to Russia," says Testoni, "and therefore to counter news that [is] unfavorable." A U.S. Senate report in January highlighted the March 4 Italian election as a potential target for Kremlin meddling. And Italy's annual report on security threats, released Feb. 20, warned about online disinformation. Without naming names, the report cited what it calls influence campaigns that aim to condition both the sentiment and political orientation of public opinion, especially at election time. On Thursday, just three days before Italy goes to the polls, Di Maio announced with much fanfare the names of his would-be cabinet team, should President Sergio Mattarella tap him to try to form a government. If such a government were to win a vote of confidence in Parliament, Di Maio would become prime minister. Di Maio presented the names as an "act of transparency," in contrast with the smoke-filled-room bargaining that is typical of Italian post-election dealmaking. 5-Star's rivals dismissed it as a publicity stunt. Coalition governments are the norm in Italy, but 5-Star has long rejected the idea of forming alliances with mainstream parties. Di Maio recently indicated he would be willing to accept their support on specific issues — "without any type of alliances." Italy holds its general election on Sunday, and a party founded by a comedian on an anti-establishment platform is in the lead. The Five Star Movement has set its sights on heading the next government. NPR's Sylvia Poggioli has more. SYLVIA POGGIOLI, BYLINE: Last month, Five Star's 31-year-old leader, Luigi De Mayo, announced his party candidates, chosen to counter charges of incompetence from critics. LUIGI DE MAYO: (Through interpreter) These are not competent people. They are super competent. In politics, both brains and heart are needed. POGGIOLI: Candidates range from teachers and surgeons to the admiral who commanded naval operations in NATO's 2011 Libya attack. Hours later, the admiral withdrew. It turned out he had been elected in his town last year on a rival party slate. More embarrassing were recent expulsions of 12 MPs who broke party rules obliging them to give 50 percent of their salaries to a small business fund. Five Star has been running Rome City Hall since 2016, but its mayor is widely criticized for declining city services. At this marketplace, stall owner Claudio Zampa has a strong case of voter's remorse. CLAUDIO ZAMPA: (Through interpreter) Look at all these Five Star people. They think they're saints. We all voted for them last time, but never again. POGGIOLI: Despite bad reviews in Rome, nationwide Five Star is No. 1 in the polls at more than 27 percent. Founded less than a decade ago by comedian Beppe Grillo, Five Star's claim to be an Internet-based direct democracy attracted many Italians disaffected with traditional parties. It's openly populist, anti-immigration, anti-vaccinations and anti-European Union. Many analysts worry about Five Star's foreign policy, including a call to lift EU sanctions on Russia. Founder Grillo has praised both Russian President Vladimir Putin and U.S. President Donald Trump as strong statesmen, a blessing for mankind. Jacopo Iacoboni is the author of a book on the movement. Contacted by Skype, he says there's no evidence of Russian financing. JACOPO IACOBONI: But we have strong evidence of a series of meetings with the Russian officials. And there are a lot of people in the Five Star that are openly pro-Russia. POGGIOLI: The news site Buzzfeed has reported that Five Star platforms posted content from the Russian outlet Sputnik, as well as many fake stories, including a claim the U.S. State Department secretly funds traffickers smuggling migrants to Italy. Founder Grillo dismissed charges of spreading fake news online as ridiculous. But Michele Testoni, professor of international affairs at Rome's John Cabot University, says Five Star has mastered the use of automated accounts known as bots. MICHELE TESTONI: They're created exactly to invent issues or to spread massively news that are favorable to the party, maybe to Russia, and therefore to counter news that are unfavorable. POGGIOLI: A U.S. Senate report last month highlighted the Italian election as a potential target for Kremlin meddling, and Italy's just-released annual report on security threats warned about online disinformation. Without naming names, the report cited what it calls influence campaigns that aim to condition both the sentiment and political orientation of public opinion, especially at election time. Sylvia Poggioli, NPR News, Rome. (SOUNDBITE OF BATTLES' "FUTURA") Transcript provided by NPR, Copyright NPR.